Previous Story Panasonic G85 Field Test: Impressive successor to the G7, is it your best sub-$1,000 MFT option? Have you ever wondered what it would be like to have Lightroom adjustments right at your fingertips and feel like you're using your hands to create great images? 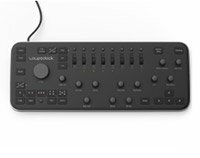 The Loupedeck photo editing console for Lightroom does just that by assigning Lightroom adjustments and tools to switches, dials and buttons on a dedicated control console. The Loupedeck is about the size of a full-size keyboard and it weighs 2.2 pounds (1,000 grams). It has a large dial, scrolling keys, small dials and is constructed of plastic with a matte black finish. You can see its full functionality in the diagram below, and it is very full-featured. There are dedicated dials for contrast, highlights, navigation, comparing before and after photos, individual color channel adjustments, undo, brush tool activation and much more. There's a five-person team based in Finland behind the Loupedeck development, including engineers and designers from Nokia. The team started work on Loupedeck in earnest in February, but the idea has been in the works for three years. You can hear more about the motivation behind the product in the video below. The Indiegogo campaign for Loupedeck has a month left and is currently 60% of the way towards its €75,000 goal. The product is expected to be delivered to backers next June and if you want to get your hands on one, you will need to pay US$249 plus shipping costs (it ships worldwide). There are also nine "Double Whammy" packages available, which grants you two Loupedeck consoles for around US$475. Or if you're a big spender, you can shell out nearly $10,000 and have you and a guest flown first class to Helsinki, get put up in a 5-star hotel and be schmoozed by the team before returning home with a unique, signed Loupedeck.